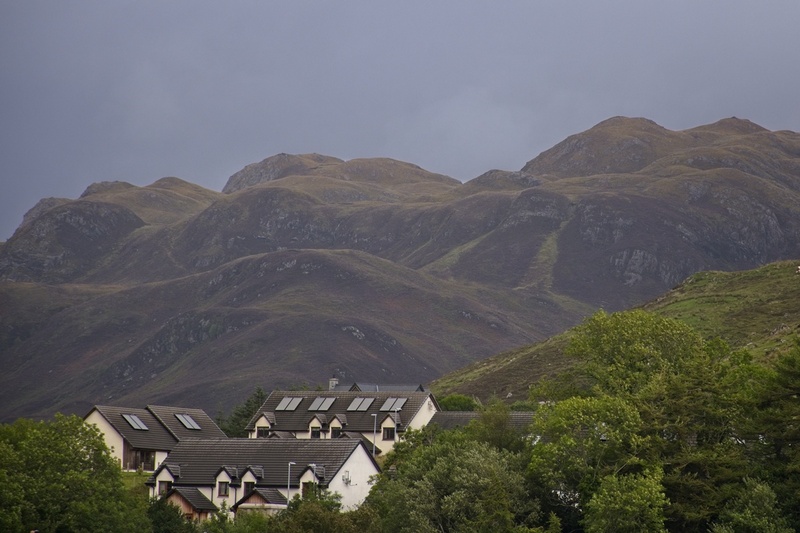 One household, nestled within the barren peaks of a Scottish highland? 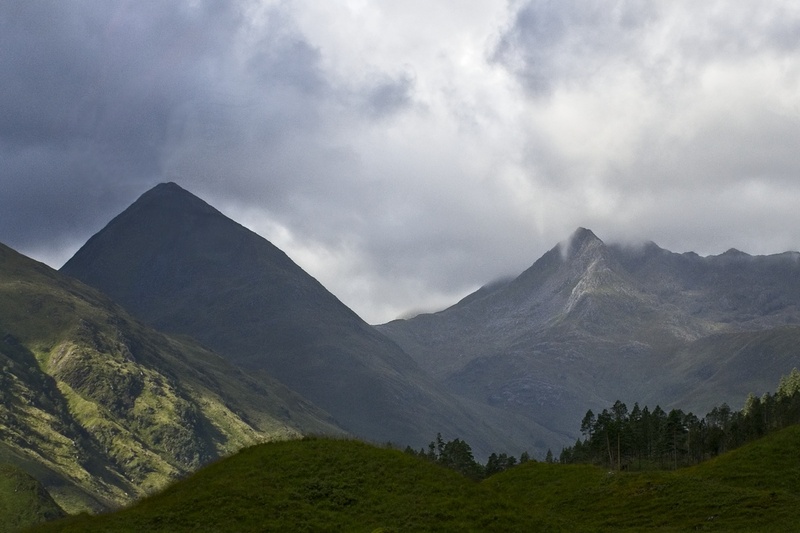 One set of mountains, high enough to cause the fittest climber to huff and puff? 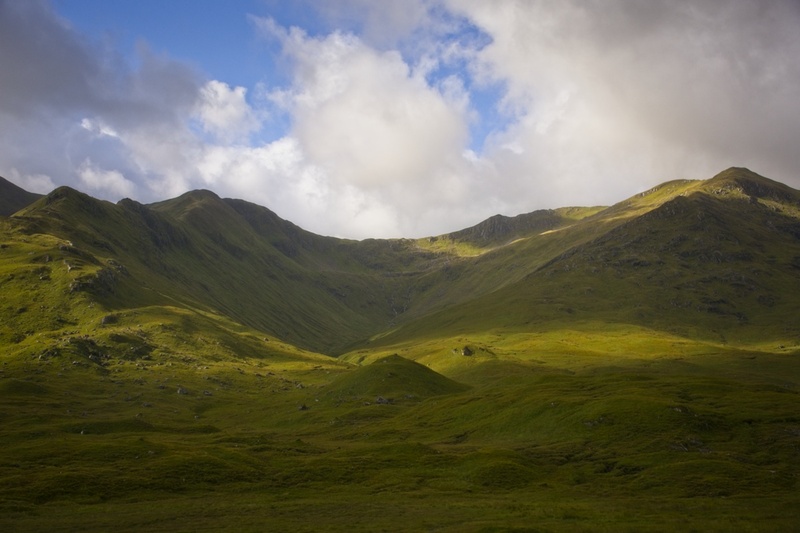 One set of yellow, undulating hills, set off against blue sky and white clouds? One lookout tower, highlighted in a sun trying to break through the gloom? One mysterious castle, where an impossible question is answered? 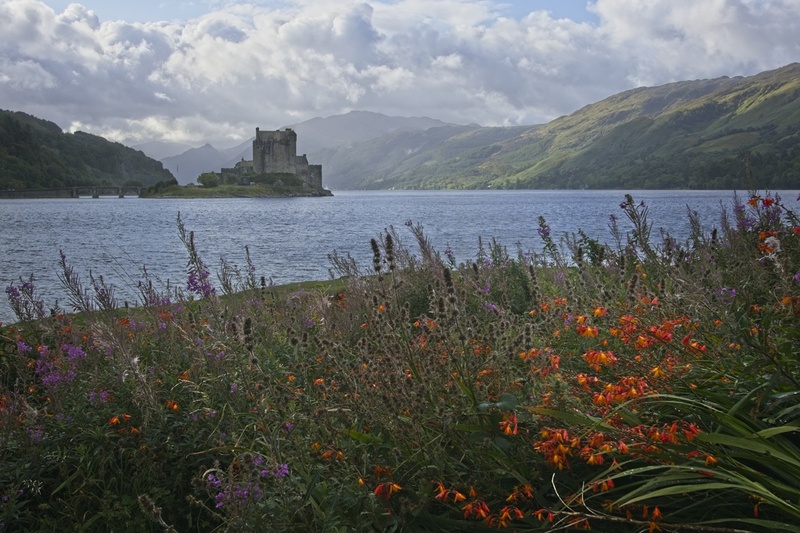 One meadow, looking over the loch at a less mysterious castle, indifferent to the works of man? 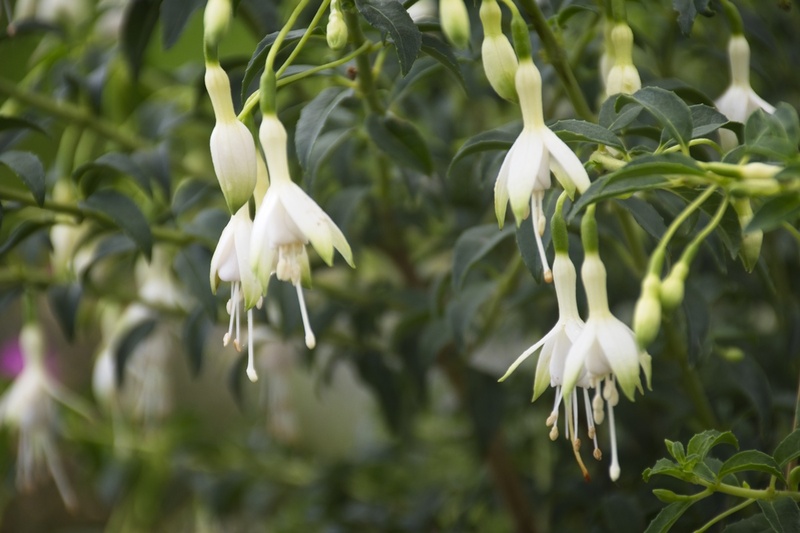 One flowering plant in the meadow, showing white for visibility, dangling stamen for easy pollination? 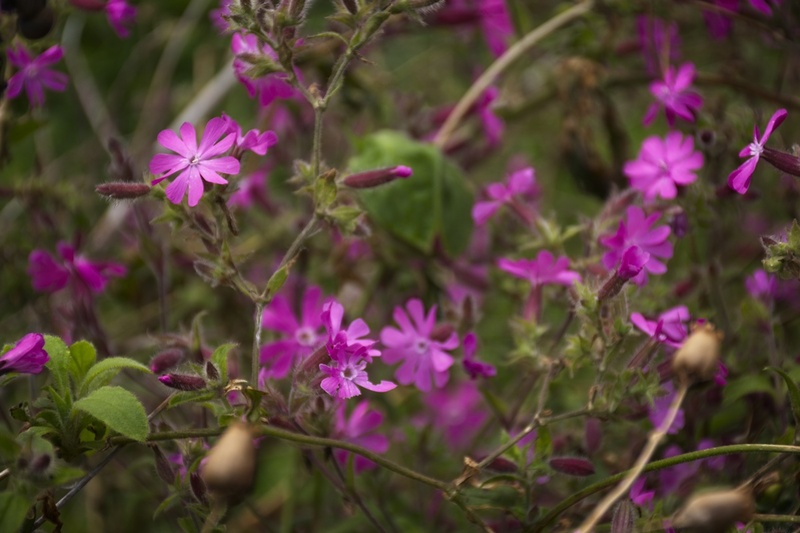 Or another one, pink, for bugs with more colorful tastes? Or a bug’s eye view of a castle, showing, from the bug’s perspective, what’s really important in the world? 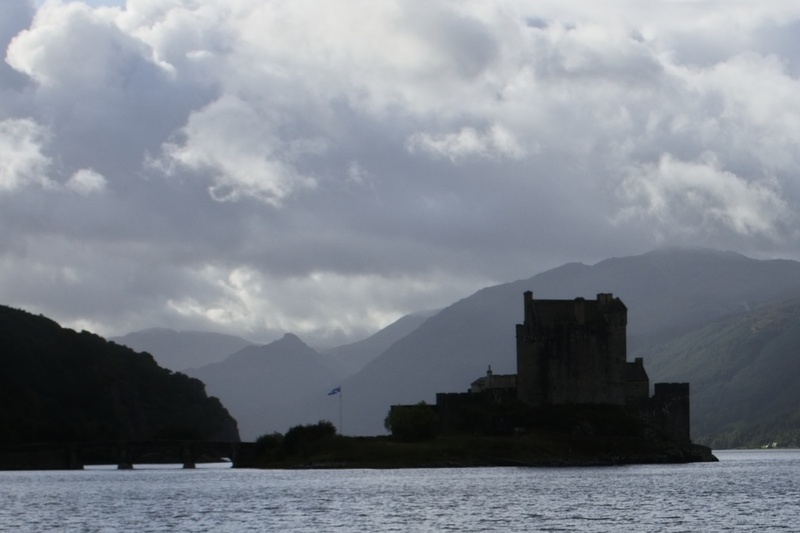 But for those of you who are not bugs, even if periodically you bug people, here’s that mysterious castle, named Eilean Donan, where a certain Highlander learned that there could be only one. In 1536, Scotsman Connor MacLeod is skewered on a sword in battle with a rival clan. Despite the apparently fatal wound, he survives, leading his clan to believe he’s been possessed by the devil. They exile him and he wanders, eventually settling as a blacksmith. He meets a “Spaniard” named Ramírez, who has an explanation for his survival. There is a hidden group of people who are nearly immortal; they can only be killed via decapitation. MacLeod and Ramírez are both within this group. 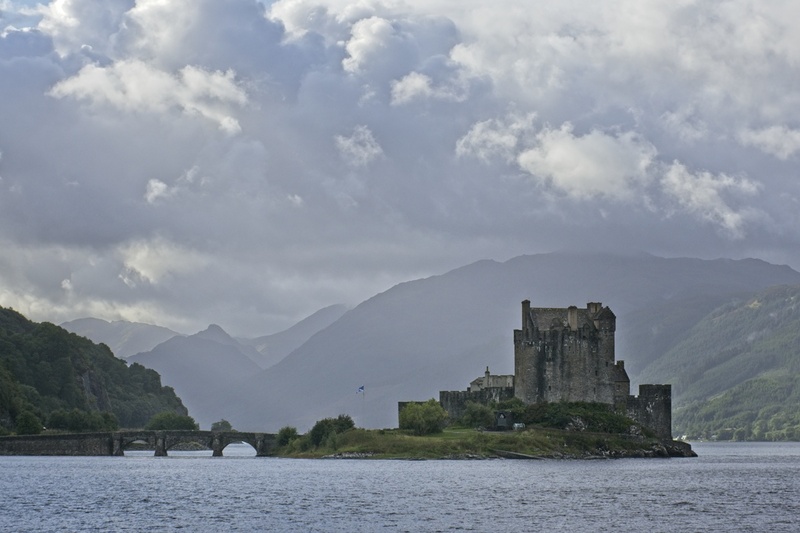 If one immortal kills another he receives his power, but Ramírez likes MacLeod and rather than killing him, takes him to his home (Eilean Donan) and trains him to fight. But he warns McLeod, there is a limited number of immortals, and over time they’ll all duel for the ultimate power. In the end, there can be only one. The movie shifts forward 400 years to resolve the final battle, it’s up to you to decide if you wish to find out what happens to who. In the meantime, my quandary for this post is which image to feature – which one might catch the new reader’s eye, which might lure him or her in? Which, even if it is of lesser quality, can fit its good parts within the short and wide banner crop? There are several candidates, but in the world of digital immortality for a featured image, there can be only one. Beautiful pictures on a wonderful theme, Dave! I like all the pictures but having also a liking for insects I like the flower photo with the blurry castle best. I am missing a picture with a Scottish lass in traditional Scottish dress. A caption might read: there are many pretty girls in the world, but there is only one that I truly love. Interesting that you liked the blurry castle shot best. It’s often a challenge deciding which photos to include in a post – that one almost didn’t make the cut. And since I included that one I also included the other flower shots. Let’s hear it for a bug’s eye view! Love all the photos Dave but I think you selected the right one for the banner. It drew me in because I wasn’t sure where it was located. Should have known it was Scotland since that is your most recent big trip. 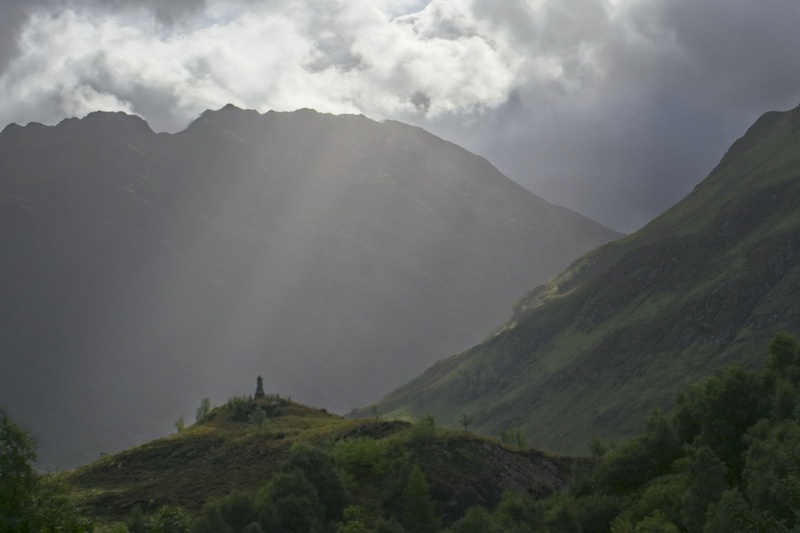 I have been only a few times to the south and never made it to the highlands. Sure hope I can see some of this myself one day! Your shots definitely got sole. The solitary watchtower is the only one for me, except for all the others, which are also great. All of Scotland appears to be made for a movie set. I saw that movie, and liked seeing a Frenchman play the Scot, a Scotsman playing the Spaniard, an American playing the Russian, it all makes perfect sense. The watchtower was my first choice for the featured shot, and by far the one I spent most time editing, but unfortunately the banner crop destroyed the composition. I did think it odd the Scot had a French accent, and the Spaniard (although he claimed to be originally from Egypt) a Scottish accent. It’s been long enough since I’ve seen the movie I’ve forgotten how the Russian sounded, just that he was a hulk of a guy. I understand the castle was also used in a Bond flick as well as a few you probably haven’t heard of, and the Highlands have been used for movies and TV quite often. Anyone who has traveled in Scotland remembers how beautiful it was – then you see photos and think, it is more beautiful than I remember. There is a lot of beauty there for sure. But then I didn’t take (or share) pictures of the more mundane, whereas your memories are a blend of both. I guess that’s one reason I like photography, it helps me remember the best parts. Such stunning photos! You have me at the title–I loved Highlander, especially the soundtrack! “Who wants to live forever?” That may be my favorite Queen song, so powerful but yet so poignant, considering Freddy Mercury was probably deathly ill when he sang it. There may only be one, but you sure picked a good one! Several good ones to choose from, this time. Thanks, Ann. Oh my goodness – just beautiful pictures!! Thanks for sharing the only one with us! What a wonderful story and photography! Some places are unique indeed, and all your images together tell the story of this uniqueness. I suppose that’s a challenge for some pictures – how to make an image that 100 other folks haven’t already made and plastered all over the internet. Fortunately, there is a lot of uniqueness out there. I always agonize over the feature photo. I feel that it should be representative of the entire post, but not too detailed to be distracting. You made an excellent choice here. The outline of the topography and the threatening gray skies really fit the bill. Sometimes it can be a tough call. In this case, my first couple choices for the featured shot simply didn’t crop well in the banner format. Pretty much any vertical format shot is an automatic no go. I suppose it’s like looking for a good idea; throw a few against the wall and see what sticks. They’re all great shots, but I’ve got a thing for meadows. The one on the loch is dreamy. It looks as though you’ve made your choice, and it works great. It must be a beautiful place then, and I’m all for the planet being full of beautiful places. I LOVE the original Highlander film. Thanks, Hook. I guess I really need to watch it again – it’s been a long time.